Zu Haus at Home shared her gorgeous fall vignette. I love the grey and creams together. Decorating Cents showed off her new blue/grey focal wall in her living room. Beautiful. Believe and Inspire transformed an old book-shelf and created this shabby chic lap desk. Shabby Criss gives a great tutorial on how to create these fabric pumpkins. 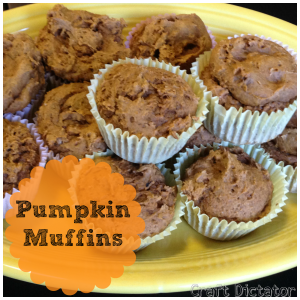 Craft Dictator shared a super easy recipe for pumpkin muffins. Thanks so much for hosting Judy! Have a great week! Thanks for hosting! Hope your week is off to a great start! Thanks so much for featuring my fall vignette and thank you for hosting! Hi, Judy! So very glad to be able to join you this week! Thanks so much! Thank you for another great party Judy. Have a great week. Thanks for featuring my new wall color. Thank you for hosting this great party. Keep up the great work. Please stop by and check out our weekly party. Thanks for hosting Fall into Fall, love joining in. Sunshine here (BC coast) so garden clean up is this weeks job. Thanks for hosting Fall into Fall Judy. Its has been a few days of garden clean up (and I think I just 'did' the garden). Time goes by so quickly. Easiest Apple Pie Recipe Ever! !